3D surfaces are usually derived, or calculated, using specially designed algorithms that sample point, line, or polygon data and convert it into a 3D surface. ArcGIS can create, store, manage, display, and analyze terrain surfaces. Geoprocessing tools can further be used to convert each surface to another surface model representation. A terrain dataset or a derived terrain surface (TIN or raster) can be visualized in ArcGIS in both 2D and 3D using ArcMap, ArcGlobe, and ArcScene. 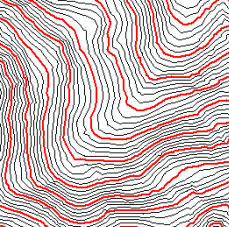 Terrain datasets can be visualized as a 2D map in ArcMap through a terrain layer. A terrain and a TIN layer behave similarly in ArcMap including the ability to support multiple renderers. Both layer types can display the triangles symbolized by elevation range, slope, aspect, and hillshade. 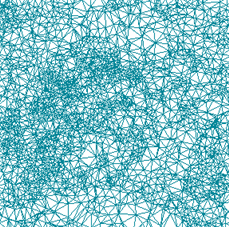 As well, you can see the breaklines, triangle edges, and nodes or points in both layer types. In terms of differences, a terrain layer supports levels of detail (LOD) through building pyramid levels. By defining multiple scales of rendering, pyramids help speed up the display, particularly at small scales when a large volume of data is involved. 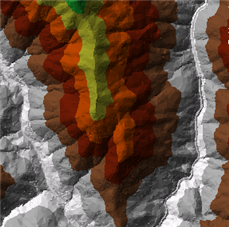 Terrain datasets display an area of interest at an optimized resolution. This means that if you have a small-scale area in ArcMap, fewer nodes will be utilized by the terrain to generate the TIN rendered on your screen. However, if you zoom in to an area at large scale, a full resolution (utilizing all the nodes for that area) will be used to generate a TIN on the fly. The obvious advantage is that only a small portion of the study area is being rendered in high detail, or a subsampled collection of nodes is used to generate a lower-resolution TIN on the fly. Thus, there is never an overwhelming amount of data to draw. 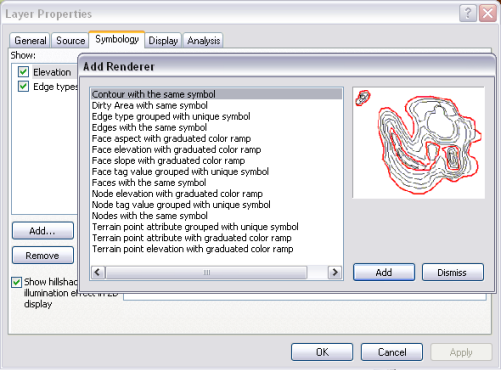 Display options for terrain datasets can be accessed from the terrain layer's properties. Double-click the layer to open the Layer Properties dialog box and click the Symbology tab. Here you have access to symbols, labels, color schemes and layer renderers. Click the Add button to display the choices of terrain dataset display renderers. Use the other tabs to set other display features, such as visibility ranges, transparency, and turning on or off attribute fields. The following three symbology renderers allow you to symbolize, display, and analyze the terrain dataset points and their associated embedded attributes. 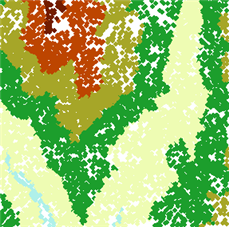 The points must be embedded in the terrain dataset itself, which is accomplished during the terrain build process. 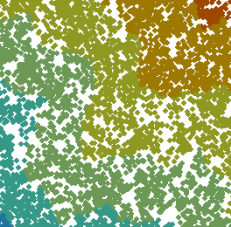 For more information on embedding mass points into a terrain, see Embedded feature classes. Attributes associated to source point measurements can be imported and stored alongside point data, which can be used for point symbolization. In the geodatabase, attributes associated to each point of a terrain dataset are stored in BLOBs. These BLOB attributes are added to the multipoint feature class when the source points are imported into multipoint feature classes using the LAS To Multipoint tool. To symbolize and display embedded points, see Displaying embedded terrain points. The interactive surface analysis tools on the 3D Analyst toolbar will not be available when displaying terrain points only by their attributes because there is no surface to use. Terrain points can be profiled and the color component of the point symbology will be used in the profile graph produced using the Terrain Point Profile interactive tool. Statistics must be generated on the attribute being used to symbolize the points when using either the Terrain point attribute grouped with unique symbol or the Terrain point attribute with graduated color ramp renderer. To learn how to calculate statistics, see: Displaying embedded terrain points. The statistical information is stored with the terrain dataset if it lives in an ArcGIS version 10 or later geodatabase. Therefore, it can be reused when the terrain is accessed in other maps. The statistical information is only temporarily held in memory to aid in the creation of a legend if the terrain lives in an ArcGIS version 9.3 or earlier geodatabase. In ArcGlobe, a terrain dataset can be visualized in 3D through a terrain layer. The display renderers for a terrain layer in ArcGlobe are identical to the display renderers in ArcMap. See the table above for information about the display renderers of ArcMap. For more information on ArcGlobe display options, see ArcGlobe display options. The surface in ArcGlobe is rasterized on the fly to provide the information needed for the globe surface geometry. Terrain datasets are TIN based; therefore, it may be more efficient to convert a terrain dataset or an extent of the terrain data to a raster DEM. This avoids the ArcGlobe step of on-the-fly rasterization of the triangulated data and improves visualization effects. 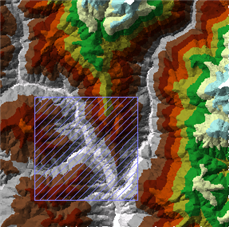 While a terrain dataset cannot be directly visualized in ArcScene, a resultant surface (TIN or raster) of a terrain dataset can be visualized in the 3D view. Convert the terrain dataset or the portion of the terrain dataset that you want to work with in ArcScene to either a TIN or raster dataset. You can use either the Terrain To TIN or Terrain To Raster 3D Analyst geoprocessing tools to complete the conversion. For more information on displaying raster surfaces, see About displaying rasters and 3D surfaces. The same rendering options for terrain datasets can also be used for TIN surfaces displayed in ArcMap, ArcGlobe, and ArcScene using the same renderers as a terrain dataset. See the ArcMap discussion above for information on how to access the terrain display renderers. For more information on displaying TIN surfaces, see Displaying TIN surfaces in 3D. For more information on ArcScene display options, see ArcScene display options.